Daphne tells Shane that Des may well get the sack because of her. She's going to hand in her notice tonight. Shane tells Max he wants to know why he left Maria. Max says he might not like what he hears - he'll have to talk to Maria first. 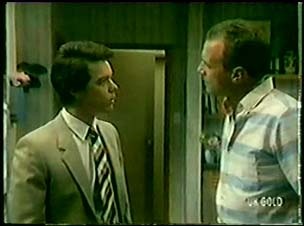 Paul tells Jim he's going to finish his degree. Danny tells Shane that he's better off without Max - he's fed pu of his complaining and yelling. 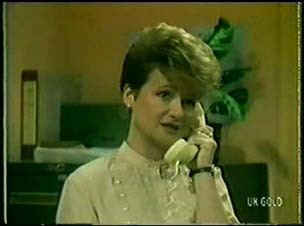 Helen answers the phone to someone wanting to talk to Paul - it's Cathy Woodfield. She tells Paul that they're looking for more staff - they want him to come in for another interview that morning. Paul is very pleased and tell Helen that he might be employed by the airline earlier than he thought. He asks Helen not to tell Jim - he's excited about Paul finishing his degree. Max is late for work. 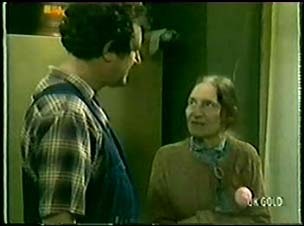 Just then his landlady (Edith) comes round to wake him up. She fusses over him but he tries to get her out of the flat so he can get ready for work. Scott is raving about Paul's air hostess job - he thinks it sounds great. Paul is off to the interview (he's decided to tell Jim about the job after all) Julie doesn't think an air hostess job will suit Paul. Julie tells them she won't be in for tea - she's going out with Greg. Paul thinks Greg is a loser. A mad woman comes round and accuses Max of stealing her knickers from the clothesline (she looks suspiciously like Lily Madigan!) 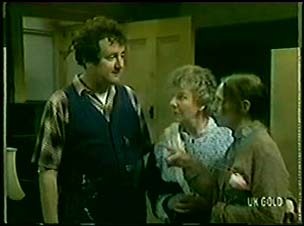 The lady, Miss Logan won't be reasoned with, but Edith the landlady comes in and explains she's taken her clothes for her. Mrs Logan tells Max she'll be keeping a close eye on him anyway! Greg thinks that Julie thinks he got the credit notices. He says he didn't, and he'll tell the girls in work that in the morning too. Edith the landlady is cleaning up when Max comes in from work. She explains that she's made him dinner to apologise for the business with Mrs Logan. Max says that he doesn't think it's appropriate for her to let herself into his bedsit. She apologises and explains that she just wanted some pleasant company on her birthday. Max is contrite and wishes her a happy birthday. He gets a bit more enthusiastic and pours her a drink. They get on well. EDITH: Tell me about your day. MAX: Well, believe it or not, after Mrs Logan, it was downhill all the way! Greg and Julie have arrived. They bump into Daphne on the door - she's come to do a job at the party tonight. 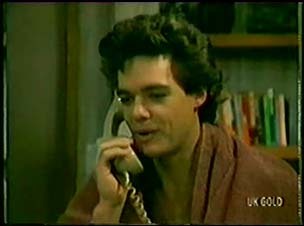 Greg introduces himself rather sleazily and says he'd looking forward to seeing a lot more of Daphne. Julie is horrified. Paul's interview with the airline has gone well. He's going to start training straight away - he's not going to do his degree after all. Jim isn't pleased at all but Paul says he's not really interested in engineering. He says he's going to make his own decisions from now on. Nick Burman has come to see Paul. They chat about Paul's decision to join the airline. Jim has calmed down a bit now - he's realised that Paul has gone from being a boy to being his own man. Jim says Paul doesn't need his approval. Julie has stormed out of the party - she hates the party even without the stripper. Greg comes on strong to Julie and she fends him off. She asks him to take her home. She tells Greg she doesn't like his friends, or him. JULIE: I've never been so humiliated in my life. GREG: You ought to get out more often! 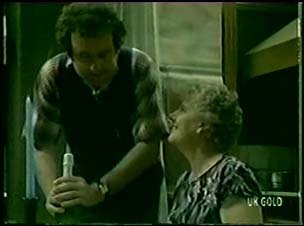 Max and Edith are talking about Shane's abortive diving career. 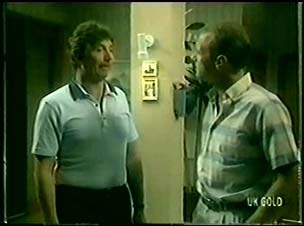 Then the conversation turns to Danny - Max says they clash, but a lot of it is Max's fault. Edith says she wishes her husband and her could have had children. She offers Max some baked lemon cheesecake. Paul, Des and Shane are hanging out watching boxing. Daphne comes in looking exhausted. She tells Des she met Greg Arnold from the bank. She starts to cry and says he was the worst - there were hands everywhere. She cries that she's sick of it all - the party brought it home to her. Shane and Des offer to go and rip Greg Arnold apart, but Daphne says it's a case of if you can't stand the sleaze, get out of th business. Des tells Shane that he can't beat Greg up because his back isn't right yet. Des and Paul head off to do the deed. Des doesn't look at all scary with his nose plaster on. DES: Danger is our business! He and Paul promptly walk into the door! Helen is reading when Julie comes in from the party. She tells Helen it was awful - she got out just in time, and Greg was horrible. Helen says that drink makes many people aggressive. Julie fels stupid for not seeing that Greg was a creep. JULIE: Gran, I wish I understood men. Helen says she's never understand them, but she'll have fun trying(!) She says she had to put up with a lot of no-hopers before she met Bill. She suggests Julie has a bath and some warm milk. Daphne tells Shane she'll miss him - she's on the move. Shane says that Daphne should stay - he says she just needs to change her job. Daphne says she'll think about it. Des and Paul have turned up. As they approach, they see the police are in attendance. 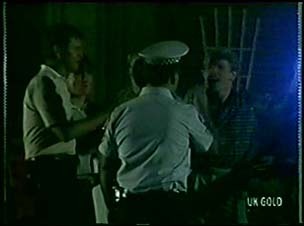 As they watch, the police arrest Greg. DES: Oh well. Mission accomplished!